I’ve preached on the woman at the well dozens and dozens of times. It is one of my all-time favorite Bible stories, where Jesus encounters a woman getting water at the well in the heat of the day and extends to her love and acceptance when so many had rejected her. But it never held the same power as today. As we were driving to the refugee camp, we passed wells where women had gathered to fill the large containers to take back to their huts on their heads, walking several kilometers a day. I took note of how many had gathered early in the morning, before the real heat set in. It all made so much more sense. So when I began to tell the story, I asked the women when they went, and none said that they went at midday. Only an outcast would do that. To add so much burden in order to avoid being ridiculed. The level of rejection must have been palpable. I shared the story with the women as we began our day of trauma healing training. One of our main goals in the first part of the day was to help the women feel the love that Jesus had for them. Specifically. Individually. That they were precious in God’s sight. There is an interesting juxtaposition with these Sudanese women. On the one hand, they hold no status or importance in the society. Even in a community that is 80 percent women and children, it is clearly a man’s world. Yet they do all the work — the cleaning, the cooking, the washing, water gathering and caring for the kids. So they don’t hold much importance, yet these are formidable women. Strong, powerful and full of joy that explodes over their faces as they sing songs of praise and celebration from memory. No one worships like Africans, and I don’t think any Africans worship like these refugee women. It is truly a foretaste of the feast to come. We wanted to empower them with stories about Jesus and his encounters with women — how Jesus saw beyond the societal taboos and embraced their value. As I shared the story of the woman who was menstruating for 12 years, and during that time was unable to touch anyone or bear children, I made the connection to their sense of being outcast and their deep desire for healing. And what Jesus does in that story is to stop a visit to someone who was very important — a leader in the church — to talk to this woman. To notice her and shower her with love. I can’t even begin to understand the context of their lives. I mean, when I told the story of Lazarus body smelling in the cave after being left for four days, I suspect they knew that smell from bodies falling in raids and being found due to their odor. 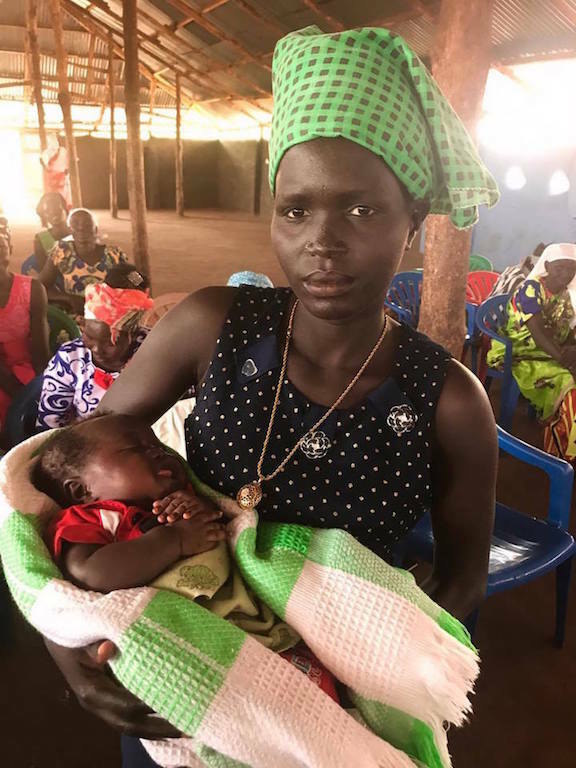 These women, on top of all that surrounds the rigors of life in the bush, fled their villages as people were coming in and killing their husbands, clinging to children who couldn’t walk as their other children ran in opposite directions. Many of them were raped, and all have lost a child, a spouse or a sibling to the ravages of war. Often, they don’t ever find out what happened. That kind of trauma makes one’s knee’s buckle. We told them stories of how it is OK to be angry at God but that they were not being punished. That God was with them in their suffering but not the cause of it. We sought to emphasize the power of God’s love in Jesus, and that NOTHING could separate them from that. And they soaked it up. When I came in the morning, I brought biscuits to give to the little kids. Seeing their faces every morning was too much for me, and so I could no longer arrive empty-handed. And the children reached out their hands and accepted those biscuits with love and enthusiasm and kept coming for more. That was how the women were with the Word. Pastorally, it was one of the most rapt, attentive audiences to whom I have ever presented. They craved the Words of empowerment, grace and love the way those children craved those biscuits. At the end of the day, we asked them to write laments, just as we had the pastors, and we were able to find several women who both read and write in Denka, so they presented them to the whole group. The level of pain, of heartache from their violent lives, was astounding. Unlike the men, who focused more on the desire to return home, they focused on the ravages of war and its toll on them. My tears began to flow when one of the older women, whose eye had clearly been plucked out, shared a passage from Romans about how we don’t overcome evil with evil. That vengeance belongs to the Lord, but you overcome evil with good. How could she say that? After all she had been through and yet she said it and meant it with her whole heart. She knew the way to peace was not through retribution. It made me think how different the world would be if women, who bear the children, were in charge. As we sat with them, they compared us to angels being entertained. And they were so grateful we cared. My goodness, but it brought me to shame. That we should be seen as the special ones when their power, faithfulness and discipleship brings me to my knees. I wish with all my soul I could share with everyone the sense of the Spirit alive in these women who truly drew strength from God, as they smiled and raised hands and danced and sang and ululated with unbridled abandon. Angels unaware? They are the angels, who in suffering still find strength. It was we who were walking on sacred ground.